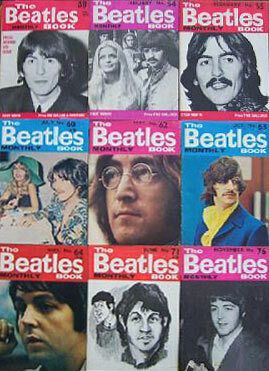 ABOUT THIS INTERVIEW: George Harrison interviews George Harrison for an entertaining chat with himself that was originally published in the November 1964 issue of The Beatles Book Monthly. George describes the article as an opportunity to ask himself some of the questions that were missed by reporters at the press conferences of their recent North American Tour. 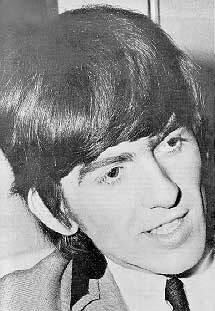 Article © 1964 Beat Publications LTD.
GEORGE: "As you know, we had five weeks of non-stop concert dates in America and Canada followed almost immediately by our present one-nighter tour of Britain. So quite a few questions and answers have been flung to and fro between us four and the world's press reporters in the last couple of months. I'd like to hold a press conference of my own. I'LL ask the questions, and I'll try to answer them... if they're not too tricky!!! Some of them will be questions I've wanted reporters to get around to asking, and some of them will be questions which have cropped up most frequently in the letters we get from 'Beatle People.'" Q: "You've been called 'the most easy-going Beatle.' What do you take that to mean?" GEORGE: "I suppose it means alot of things which are true. I'm slow-- I like to to take my time whether it is to think out a reply, or to tune up my guitar. I hate to dart from one subject to another. I get some sort of personal satisfaction out of finishing one thing before I start another." Q: "Does that mean you don't make friends easily?" GEROGE: "On the contrary. I'm extremely interested in people. I think I make an easy target for folk who like to talk about themselves. It takes a long time for them to bore me because I enjoy listening to new ideas and different opinions. That's what life is for-- to find out fresh things and learn new facts." Q: "Surely your life with The Beatles has put a stop to that." GEORGE: "No. By nature I hate rushing, so the pace of things is one drawback to being a Beatle. But don't forget that I've been with John and Paul for more than six years now, and we know each other inside out. Our individual characteristics-- and I include Ringo in this, of course-- balance against one another remarkably well. It is because our personalities work at different pressures that we get on so well together as a team." Q: "Are you the most musical of The Beatles?" GEORGE: "Depends what you mean. People have said I am, just because I admit to liking Segovia's guitar playing and they think that's all very highbrow and musical. I believe I love my guitar more than the others love theirs. For John and Paul, songwriting is pretty important and guitar playing is a means to an end. While they're making up new tunes I can thoroughly enjoy myself just doodling around with a guitar for a whole evening. I'm fascinated by new sounds I can get from different instruments I try out. I'm not sure that makes me particularly musical. Just call me a guitar fanatic instead, and I'll be satisfied." Q: "You are the youngest Beatle. Do you 'feel' younger than the others?" GEORGE: "There again, it is important to remember that we've been close friends since school days. A year or two either way doesn't make the slightest difference in our age group. It would if you were talking about a George age eight and a John age eleven, but as a group we've all had just about the same amount of experience and, of course, we've shared all the same adventures." Q: "What do you think about fans?" GEORGE: "Alot of rot is talked about kids getting out of hand and suchlike. Even a kid who is quiet on her own takes the opportunity of letting off as much steam as possible when she's with the gang. It doesn't mean she's out of control-- just that she's learnt how to have fun. Boys are the same-- they let off steam in different places. Girls hang around stage doors or in the front stalls; boys inside a football ground or at a boxing match. But whatever way you look at it, the Beatles... and every other group in the top twenty... rely entirely on the fans. It would be no good finding a good song and making a terrific recording of it if there were no fans around to decide whether they liked it or not. To any artist fans are vitally important. An artist who did well and then wanted to forget about his fans might as well forget about his fame at the same time." Q: "Do you spend most of the money you earn?" GEORGE: "I am interested in money. When I hadn't had much of it I was just as interested in what a small amount could be made to do. Naturally anybody spends more or less according to his income, so I suppose I spend plenty by some standards. On the other hand I hate the idea of just getting rid of money because it's in your pocket. I like to keep as small a wallet as possible in case I'm tempted to waste cash on unnecessary things. I haven't got a very good business head, but if my life had been entirely different and I'd only had a little savings in the bank, I reckon I'd have made a success of some small business by taking advice from somebody. I'd have asked what I ought to do with my saved-up money to make it grow." Q: "Have you grown away from your parents because of the life you lead?" GEORGE: "An unfair leading question, that! I haven't grown away from my parents at all. In fact I think a boy who spends some of his time away from home grows even closer to his relatives. They are not taken for granted so much if they're not around every day. I don't live in Liverpool any more, but I can't really say I live in London or anywhere else either. In this game it is a matter of staying overnight in dozens of different places each month, and you have to learn to set your boots and your luggage wherever it's most convenient." Q: "What about the other side of the same question. Don't your parents get caught up with your life whether they like it or not?" GEORGE: "I can only answer half of that question because my mother and father are caught up in the success of The Beatles, but they don't mind it a bit. In fact they're very, very helpful about it as alot of 'Beatle People' will know. They deal with alot of my fan mail when I'm away from home and their back room looks like a G.P.O. sorting office half the time." Q: "Final question. What type of press interviews do you think are most useful?"